Every man and his dog has logged onto YouTube and seen Dereck Chisora and David Haye make fools of themselves after Chisora's fight with Vitali Klitschko. The pair scuffled in the post-fight press conference when Haye decided to mouth of at Chisora, mocking his recent run of three losses in four fights. Chisora being Chisora he couldn't let the matter drop, and soon enough punches were thrown. Chisora faced a hearing with the BBBofC to see if the British boxing honchos would grant him a license to fight in the UK. I don't doubt here that Chisora's promoter Frank Warren, as well as Warren Promotion's legal department, put up the best defence they could, but the result was inevitable. Dereck Chisora was denied his boxing license. 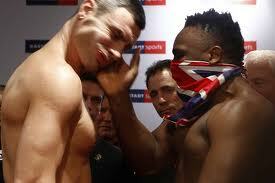 Chisora and Warren have decided to lodge an appeal. Is there any merit to it? Probably not. In this age of viral videos, someone in the public eye doing something stupid really has no comeback. But you can understand Chisora wanting to fight the decision - he is twenty eight years old, and losing his license for the next few years takes a good chunk out of what should be the peak years of his career. Of course, Chisora can still fight in another country, but where does he go? America is an obvious choice, but even after his media-sponging antics his name still isn't massive there. The next stop would be somewhere else in Europe, with Germany having a particular love for heavyweight fighters. That's a no go too - there is no way German boxing authorities would want the press. Chisora could always go to Asia and ply his trade there a la Edwin Valero, but then countries like Japan aren't known to love the higher weight divisions. I don't know what Chisora does from here. Celebrity Big Brother maybe? "The appeal has gone in already. The grounds for the appeal are that we're not satisfied with the way the hearing went." Yeah, I bet he and Dereck Chisora aren't satisfied with the way the hearing went - he lost his damn license.